Got an update last week with my ballot. Apparently they are in the process of confirming their compliance with the new rules for going national. Looks like a done deal and they are shooting for a fall 2018 launch. Would imagine there will be some sort of promo to accompany the fanfare. There will be a 180 day transition period when all eligible deposits will be covered fully under provincial rules, then CDIC rules will kick in. Good to know Rick, thanks. Yes, they were originally shooting for January 1st, then April, then June/July, but now it looks like August-October, I would speculate. OSFI's probably a bit too diligent, if you ask me. They are taking far too long in bank approvals. Sask Inn. CU reply to question, can one buy a gic from Ontario? "You can, what we would have to do is open a new membership and find a Credit Union near you that we could get you to sign documents at." Got an update last week with my ballot. Thanks for the update, Rick! For those of us who "come from away", as a customer / member, what has been your overall impression / experience in dealing with CC? Should we (Easterners) be on the edge of our seats anticipating their National exposure with potentially attractive promos, backed up by competent and dedicated customer service? I think this thread pretty much sums up my opinion of CC. Although I am taking advantage of the 33 month @ 4% promo GIC, I don't use them mostly because their rates are more in line with the big 6. There are better options to get ding-free service that actually pays interest on your savings. I am presuming they will offer promos when they go national, but will still have crappy rates when the promos expire; ala Tang. They're on the Exchange network (for now??) so I do use their ATMs to get my cash out of Motive. That discussion thread provides some valuable insights into how a FI loses sight of customer needs, particularly with customers like most members of this Forum, who have a broader perspective of banking operations across Canada. Inability to adapt to the evolution in market conditions has left a trail of corporate corpses. Will we see the same in financial institutions that fail to recognize they are no longer the center of their own universe, that there are alternatives out there thanks to the internet? Everyone has their own experiences but for me, as a POA who assumed control of a senior's accounts, Coast Capital couldn't have been more helpful, whether on the telephone or in-person at the Richmond Centre branch. Right from when I exercised the POA, consolidating accounts from other FIs, through to wrapping up the estate for that individual ... it was absolutely smooth sailing over the 6 or 7 years. And, on the other side of that same coin, the CIBC branch at Garden City and Blundell couldn't have been more useless throughout that same period of time. Well, finally, we have a "go live" date on Coast Capital Savings' re-incorporation as a federal credit union. And, it's going to happen quite quickly. Coast Capital Savings has just announced today, via press release, that effective this Thursday, November 1st, 2018, they will officially be re-incorporated as a federal credit union under the previously announced new legal name, Coast Capital Savings Federal Credit Union. Transitional CDIC insurance kicks for the next 180 days, inclusive, on pre-existing deposits prior to the "go live" date while normal CDIC insurance limits would be applicable to deposits from new customers. They've already got a fully online new member onboarding system, so you are all free to become members if you wish as of Thursday. Separately, they recently announced that Calvin MacInnis had been named Coast's new President & CEO effective Oct. 1st, 2018, succeeding Interim President & CEO Bruce Schouten, who previously worked for OSFI and who has now returned to his previous role of Chief Risk Officer for the soon-to-be federal credit union. It hasn't been announced whether Helen Blackburn, who previously headed up Central 1 Credit Union, will return to her previous Chief Strategy Officer role with the credit union after having served as Interim Chief Risk Officer while Bruce handled other duties. Interestingly, Calvin was most recently the President of TD Direct Investing in Canada and, prior to that, headed up Qtrade, which is Coast's discount brokerage partner. B.C. unlimited deposit insurance like Vancity? Online services are limited compared to other CU's so not sure what they are trying to do. Be the first national brick and mortar CU? Only things they have going for them is the they sometimes have irresistible offers with weird terms (Sorry Hotmony...couldn't see anything currently) and maybe some small business and investment tools some people might be interested in. Might be interesting to keep an eye on them and see what they do. No, deposits will be insured by CDIC now. Transitional CDIC insurance means that CDIC insures pre-existing deposits for 180 days inclusive of the "go live" or effective date (Nov. 1st, 2018) under the previous provincial deposit insurance regime; however, deposits from new clients, and possibly new deposits from existing clients, are insured at standard CDIC maximums. However, Coast did an analysis and fully 95-97% of their depositors were unaffected by the change from CUDIC in B.C. to CDIC. Took a quick look at their website.Saw a 200$ promo for opening a no-fee checking account.Sounded great till reading conditions.Must be a BC resident.As stated above ,rates for GIC's are nothing to get excited about. If they aren't officially reincorporated until Nov 1, then they are still under the provincial regulator as to membership. And there may be no compelling reason for them to change that on day 1 of their federal life, although they very well might. NorthernRaven, you are both correct and incorrect. On the first point, you're right that they don't "go live" as a national credit union until Nov. 1st (today). On the second point, though, B.C. 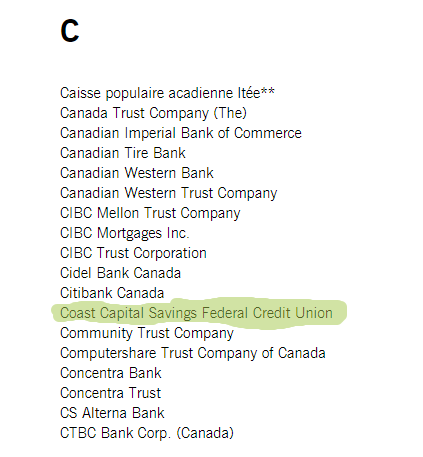 's Financial Institutions Commission and Credit Union Deposit Insurance Corporation now have absolutely no oversight whatsoever of Coast Capital Savings Federal Credit Union. B.C. residency is no longer a requirement for them. Central 1 Credit Union will still serve as their group clearing institution and back-office payments and technology provider, but that's the extent of their involvement. Everybody's "go live" date is getting pushed back roughly 12-18 months. Innovation Credit Union in Saskatchewan has had its members pass the required motions to re-incorporate federally and they had planned to "go live" in early 2019 so I expect them to be a federal credit union by late 2019 or early 2020 now. Also up is Meridian Credit Union's long-delayed incorporation of a federal bank subsidiary. They'll still be regulated provincially and can accept out of province residents (Ontario regulator permits this, but DUCA just opted to change its residency requirements internally), but they want to have a wholly-owned subsidiary (an approach that doesn't make as much sense to me - separate regular, separate capital adequacy requirements, more "red tape," more overhead, etc. - they should've just re-incorporated federally; maybe they're thinking of modifying their proposal, I'm not sure). Another Saskatchewan credit union, Conexus Credit Union, was rumoured to be eyeing such a move, as was an Alberta credit union, but whether it'll be Servus or Connect First, I'm not sure. I read through some of their website, and it is very clear that they have no intention of rushing into the national market. We will have to bide our time. Any updates on when they might be going national. Has it been delayed? Anyone know? They actually re-incorporated federally Nov. 1, 2018, so they can legally solicit clients from outside of B.C. now; however, they're not doing so despite the fact that new and pre-existing deposits have been insured, to varying limits presently, by CDIC since then. No reason for the delay...I thought it might have to do with not having an Ombudsman and required "offices," but looking at their Book of Fine Print, in Fairly Large Print (see: https://www.coastcapitalsavings.com/media/1643/book-of-fine-print-in-fairly-large-print.pdf), it looks like they've got all those required "offices" established and have included the required Access to Basic Banking, Coercive Tied Selling, and Banking Agreements within the "book." Could be technological (you can't yet link external bank accounts to your Coast accounts, which annoys me a fair bit), or could be staffing in the Contact Centre. I'm not sure what the reason is. It's not statutory, though, as all approvals are in place. Looking at Central 1 Credit Union's MD&A, there's even a note about Coast Capital Savings having withdrawn all of their required regulatory deposits with and shares in Central 1, which materially affected Central 1's shareholder equity financial statement.